The Andalusia region boasts of some of the most outstanding beaches in Spain. The beaches of Andalusia are strategically located along Spain’s wonderful coastline, and are easily accessible by road. Some can also be accessed by air. Visiting any of these beaches provides you with very memorable experiences. Bolinia Beach is surrounded by a gigantic white dune and the impressive San Bartomolme Mountains. It is one of last beautiful beaches of Andalusia that have not been tampered with by modern development. The beach is home to the historic Baelo Claudia Archaeological Centre. The Bolonia Beach offers a wide area of sea water, where you can swim comfortably without worrying about windsurfers or rocks. You can also lie lazily on the fine white sand and enjoy the sun without feeling crowded. Playa de Almayate Beach is situated next to River Velez. It has dark gravel, and sand, and usually experiences very moderate waves. It is full of superb bars, cafes, and restaurants that offer local drinks and dishes. Playa de Almayate Beach is surrounded by natural vegetation, making it one of the best beaches that offer very cool breeze. The beach is easily accessible by road. If you would like to reach the beach in style, you can take a flight from the Malaga City. Malaga flights are not only comfortable, but they are also very affordable. 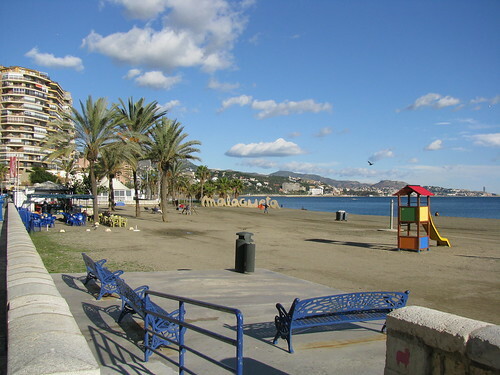 Playa de la Joya Beach is surrounded by a very quiet and peaceful environment. The beach is nestled between Penon de Jolucar and El Cabo de Sacratif. It is full of golden yellow sand and boasts of impressive blue waters. Even though it lacks bars and restaurants, it is a very wonderful place that allows you to cool off your mind without unnecessary disturbances. The beach is accessible by car. Playa de los Muertos Beach, also referred to as the Beach of the Dead, is situated near the Natural Park of Carbo de Gata and is surrounded by turquoise rocks. It is one of the best beaches where you can enjoy swimming and fishing. It is also lined with vibrant restaurants and bars that offer wonderful drinks and meals at very affordable prices. The beach’s crystal-clear sea water is home to wonderful tropical fish. The sand on this beach comprises of multi-coloured tiny stones. Due to its location, getting to the beach involves a bit of trekking. Playa Huellin Beach is one of the beautiful beaches of Andalusia that is situated on the south of the port of Malaga. It is widely known for its beautiful promenade that is named after one of Spain’s best actors – Antonio Banderas. The beach comprises of very fine grey sand that is comfortable to sleep or walk on. It is equipped with magnificent hotels, life guards, hammocks and beach umbrellas, making it one of the most preferred places for family vacations in Andalusia. The beach is accessible by bus. If you need more luxury, you can get to the beach by air. Just book the Malaga flights and you will get there in effortless style for your vacation. Playa de Matalascanas is a town beach in Huelva Province, Andalusia that stretches about 45,000 m2 in length. It offers water sports such as surfing, fishing and swimming. The beach has golden sand, and is equipped with very modern facilities such as sunshades, showers, and sunbeds. The beach is accessible by bus. Have you seen the beaches in Catalonia? I had been to Granada and other parts of Andalusia but never had the chance to visit a beach there…but yes I spent some times in Callela..
Andalusia has amazing beaches, Cadiz is great but Tarifa has amazing ones as well and of course Malaga which majority of travellers seems to skip in favour of other places in the Costa del Sol.